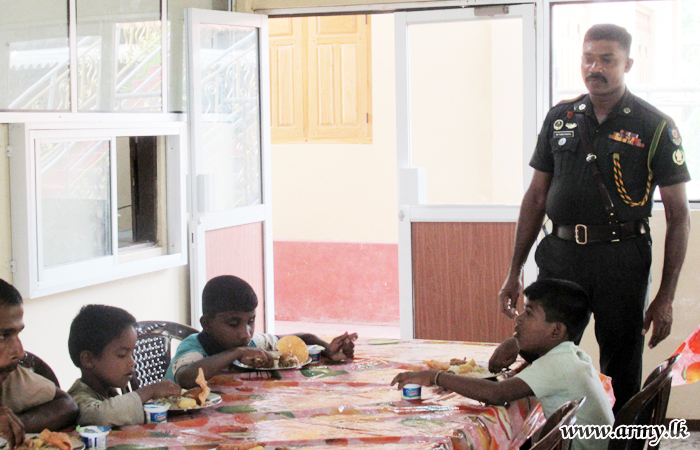 Despite persistent calls for demilitarisation the Sri Lankan army distributed food at a care centre for Tamil children in Puthukkudiyiruppu last week, continuing to exert its presence across the North-East. According to an official military website, soldiers from the 68 Division visited the care centre on Saturday. Puthukkudiyiruppu in the Mullaitivu district was one of the hardest hit areas from the Sri Lankan military offensive which ended in 2009, with a hospital in the area repeatedly shelled and reports of chemical weapons being deployed in the region. The latest intrusion by the military into civilian life comes amidst sustained calls for the demilitarisation of the Tamil homeland. The Sri Lankan military has become increasingly present at Tamil schools and children’s centres across the region, despite Sri Lankan government pledges of demilitarisation.